For classic car aficionados and pre-war car collectors, few vehicles compare to the 1933 Lancia Astura, one of the most exclusive estate coupes of its time. Of course, this doesn't mean you can shake a stick at the rugged 1927 Studebaker Commander Big Six and its prohibition-era antics or the everymans' 1935 Aston Ruby Seven, which was one of the most popular cars of its time. All three of these historic machines, lovingly restored, will be coming up for auction to lucky bidders at the annual Silverstone Auctions Trophy Sale in Britain on Friday, May 17th. The Astura is expected to bring well over £100,000 while the Studebaker will likely bring a more modest £15,000. The Ruby Seven is anynoe's guess, as it will go on the block with no reserve and could become some lucky bidder's big find. 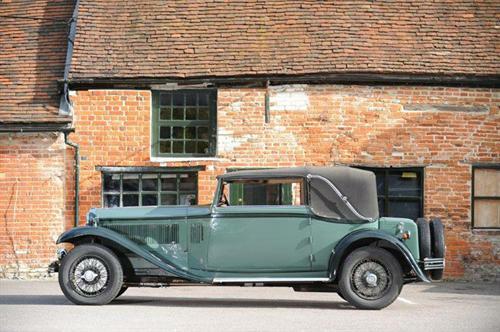 The star of the bidding, however, is definitely going to be the 1933 Astura, which has been 30 years in the restoring, with 1933 being considered by many to be a pinnacle year for the Lancia model in the second series with its classic format. Only 750 of these were ever made, built between 1932 and 1933, while the entire model line saw only eight years of production, starting in 1931. The Astura replaced the impressive Lambda, which had been outgrown by more modern technology and tastes. The Astura was the more powerful V-8 model of the Lancia lineup, with the Artena making up the lighter 4-cylinder option. The Astura saw four series of evolution during its eight years of production, with the first series being somewhat problematic rattleboxes replaced by the second series just a year later with a smoother, engine mounting reducing noise and vibration considerably. With its large 2.6-liter eight-cylinder engine producing 72 horsepower under a single carburetor and driving through a relatively advanced four-speed manual gearbox, the Lancia Astura in this second series was a beautiful goer that attracted about 750 buyers in its single year of production, appealing to some of the rising upper crust of the period. Its smooth-riding independent front suspension using a Sliding Pillar configuration was a significant improvement over springs alone and Lancia was a pioneer in independent suspensions, leading the way for others who would not catch on until well after the war. In fact, this suspension was the mainstay for Lancia vehicles until their purchase by Fiat in 1969. Lancia continues to produce vehicles under Fiat's ownership, most of which are rebadged Chrysler products.